Trying to find solutions to reduce bloating can be tricky and frustrating. I’ve struggled with my own digestive complications over the years, so I know just how not-fun it is! Bloating can be caused by a number of things, including an imbalanced ratio of good:bad bacteria in the gut, also known as dysbiosis. Let’s chat about how to reduce bloating and improve digestion! Bad bacteria in our gut feed off of sugar. When sugary substances enter our GI tract, these bad bacteria have a party eating this stuff and produce gases which contribute to bloating. When we eliminate sugar, we starve ’em! Sugar comes in many forms, from fruit to sweeteners, but the big ones we want to avoid are those that are refined and added to products (think corn syrup, brown sugar, maltodextrin, etc.) Always be sure to read the label on the items you buy. Everyone’s body and digestion is different and it’s one of the reasons why I always recommend listening to your body. Although fruit is nutritious (and deeeelicious), eating copious amounts of very sweet or dried fruit can sometimes do us more harm than good if dysbiosis is present. Eating foods we’re sensitive to time and again creates irritation and inflammation in our body. 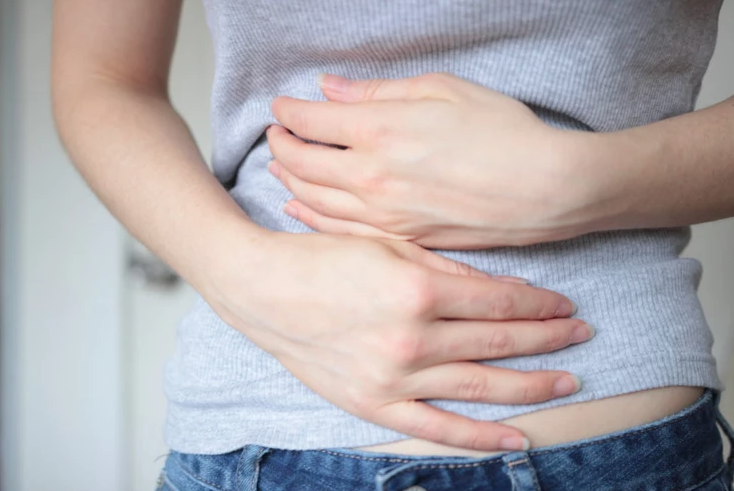 I think of all the times I’ve ever unknowingly (or knowingly) consumed foods that have terribly upset my stomach, and how much this wreaks havoc! Some of the most common food sensitivities include dairy, gluten, corn, and soy, although this can extend to a variety of other foods such as sesame or cacao. Everyone is different so it’s important to listen to your body. Keep a daily food journal if you’d like to start tracking any symptoms you may have. It’s so easy to forget to chew properly! Many of us chew too quickly which results in large food particles entering our digestive tract. These particles not only feed bad bacteria, but ferment as well. Chewing your food thoroughly means it becomes a paste in your mouth before you swallow it. This allows for optimal digestion: it enhances our enzymes ability to further break it down and provides far less of a feast for those bad bacteria we talked about! Plus, the better our foods are broken down, the more nutrients we absorb. It’s a win-win-win. Our gut and our brain are very intricately connected and are in constant communication. When we’re stressed our bodies are not able to digest food effectively. Our digestion slows down and blood is driven to our extremities (away from our gut) in preparation for fighting or fleeing! When we eat when we’re stressed, we tend to rush or chew too quickly. Be sure to take the time to sit, relax, and enjoy the food before you! Water alone is excellent for digestion (and it’s very important all of the time!) but for an additional de-bloat bonus, add a squeeze of fresh lemon. This helps improve digestion and reduce bloating by stimulating gastric juices and the production of stomach acid (HCl) which is critical for activating enzymes that break down protein and other nutrients. You can read more about the health benefits of lemon water here. Print out and use this 7 Day Food Journal to track your daily meals, snacks, digestion and any symptoms. Food Journals are an excellent tool to gain insight into which foods you feel better (or worse) consuming. Questions? Leave me a comment below!